Version 5 is arguably the most significant update to Reason yet. If you've got your copy of Reason 5 you'll already know what a significant update to Propellerhead's software studio it is. Indeed, it could be argued that, for the first time, the program feels genuinely complete. Of course, mastery of Reason 5's new features will take time, but you can speed up the learning process by trying the following 10 tips. One of Kong's best features is its powerful level-setting system, but another key point is its connectivity. Instead of mixing internally within Kong, try routing the pads out through a 14:2 Mixer and then back into Kong via the Break-in connections. This enables you to set levels and EQ with the mixer, and still use the powerful master output FX. Save your construction as a Combinator for future use. With the spectacular introduction of Kong, our old friend ReDrum might seem a little redundant now. For many situations that would be a fair assumption, but since Kong has no onboard step sequencer, ReDrum still has a beat-making role to play. Connect its Gate Outs to Kong's Gate Ins and you have the best of both percussive worlds. It's like an MPC and a 909 rolled into one! A great new addition to the transport bar is Tap Tempo. Tap tempo functions always work better the more taps they receive, so tap your beat out in double time (eighth-notes; two taps per beat) for greater accuracy. Kong includes a Pitchbend Range setting. If you've never tried sweeping the pitch of a funky electronic rhythm, now is the time, as it can be used to make energetic edits and variations. Try setting it to a full octave range, then flicking it right down to an octave below for the eighth bar of eight. Or start at -12, move to 0, then jump to +12 over three bars. Roni Size was notoriously fond of the Roland S-760 sampler, praising its ability to play a sample forwards and then backwards seamlessly. Reason 5's sample editor enables you to do the same thing, and the instruction to do it will be embedded in the sample itself when you use it in a sampler. If you want to use a favourite piece of outboard hardware with Kong, you can. Round the back of the rack, you can take the audio signal out of Kong, then Reason, just before it gets to the master effects, then run it through your hardware and send it back into Reason, then Kong. Could be handy for live shows and studio sessions alike. Most people making electronic music tend to start their tracks with an eight-bar loop, which is then copied and tweaked to build an arrangement. Reason's groundbreaking new Blocks system caters for this approach beautifully. Start your track from within the blocks edit screen, building your basic eight-bar loop. Sequencing the rest should be a breeze (block). One of our favourite features that was introduced back in Reason 4 is the Groove window. This offers a Note Length Impact control when using ReGroove that affects all notes with groove applied, creating an awesome chopping effect. Now you can use Reason 5's sampling facility to route your main output back into an NN-XT sampler and capture those live sweeps for sequencing. 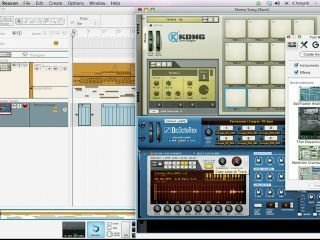 The ability to lock multiple MIDI instruments and controllers to specific instruments brings a whole new paradigm of playing to Reason. Now you can have several musicians playing one device simultaneously, or you can go the other way entirely and keep each locked to an instrument of their own. Set Reason to sample from a mic, too, and you can even record a vocal or guitar at the same time. A whole band could conceivably play a gig using just one instance of Reason!